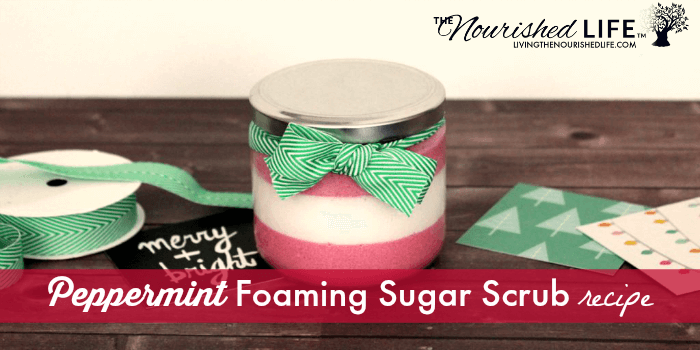 This amazing homemade Peppermint Foaming Sugar Scrub recipe can cleanse, exfoliate, and moisturize your skin in just one simple step. Because this peppermint foaming sugar scrub contains emulsifying wax, it rinses cleanly away without leaving an oily residue on skin. However, if you prefer not to use emulsifying wax, or if you don’t have any on hand, you can simply substitute the wax with either kokum butter or refined cocoa butter. 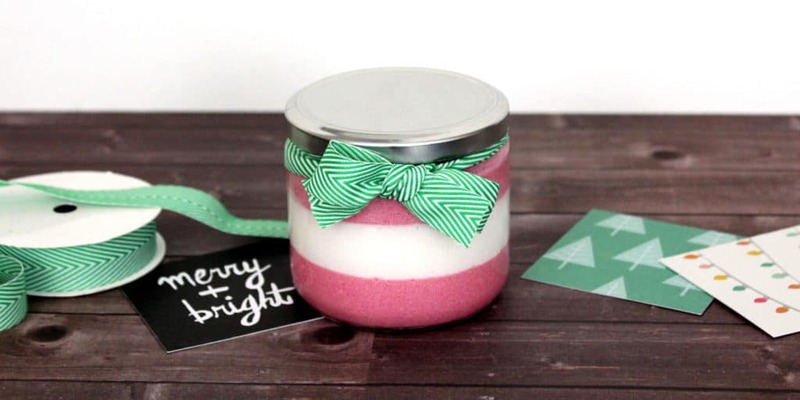 This peppermint foaming sugar scrub can be layered for a unique and very pretty appearance, and it is perfect for giving as a gift during the holidays. Plus, it only uses a few simple ingredients, many of which you probably already have in your home. 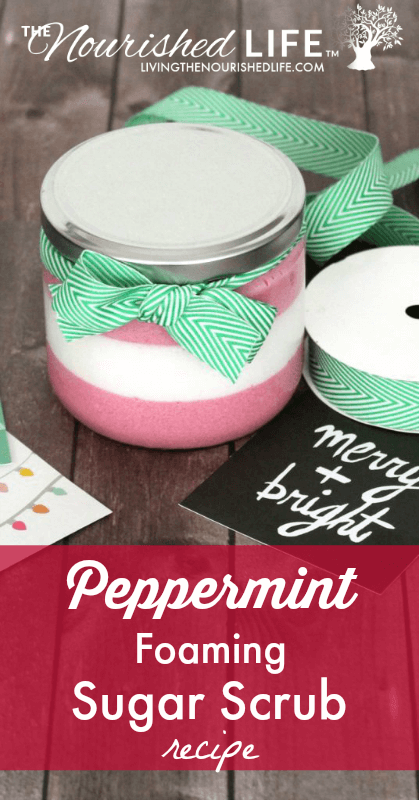 You can make this gift even cuter if you make a DIY Peppermint-Themed skincare gift basket. Consider adding: Chocolate Mint Lip Balm and Mint Chocolate Whipped Body Butter. You could also make this lovely Chocolate Mint Foaming Salt Scrub, if you prefer salt scrubs to sugar scrubs. You could also add these Foot Scrub Cubes with Menthol Crystals. Not a fan of peppermint? I’ve got a suggestion for a lavender and lemon scented foaming sugar scrub in the notes below. Or check out my 21 Sugar Scrub Recipes for inspiration. 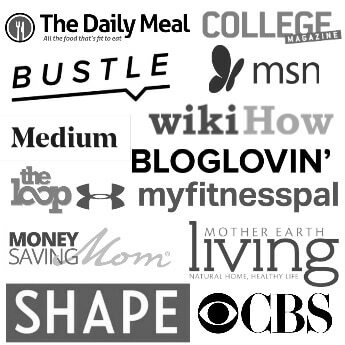 If you’re interested in learning more about essential oils, I’ve got a free eCourse for you! It’s a 14 lesson course that will only take five minutes a day. 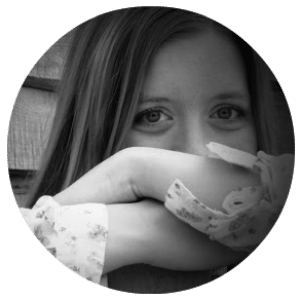 Learn more about my FREE essential oil eCourse. Using a digital scale, weigh out the shea butter and emulsifying wax. Combine in a large glass Pyrex measuring cup and heat in the microwave at 40% power until melted. Alternately, you can also use a double boiler for this step. Next, weigh out the liquid Castile soap and stir into the melted butter and wax. Follow with the peppermint essential oil: add between 30-40 drops, depending on how strong of a peppermint scent you want, and gently stir it into the wet ingredients. In a separate container weigh out the sugar. Then pour the sugar into the wet ingredients and mix to combine. If you aren’t planning to layer your sugar scrub, pour into your container of choice. (This recipe will fill two 6 oz. jars.) Otherwise, proceed to the next step. Now divide the sugar scrub evenly between two containers. In one container, add a pinch of your red or pink mica powder or red oxide pigment powder to suit. Mix well with a fork until the color is evenly distributed throughout the scrub. Pour your first layer of the sugar scrub in your color of choice into your jar(s). Place the jar(s) in the freezer. Then, put the other containers of unpoured sugar scrub into the refrigerator. Once the peppermint foaming sugar scrub in the freezer is firm, remove from the freezer. Then, take an alternate color of your scrub from the refrigerator and gently spoon a layer into your container(s) on top of the first. You can then gently pour more of the alternate color on top of the thin layer you just added. Repeat these steps until your jar(s) is full. Then package and label your peppermint foaming sugar scrubs as desired for personal use or gifting. You can also recreate this peppermint foaming sugar scrub recipe in a fresh lavender & lemon scent for spring or summer. Simply weight, melt and combine the sugar, shea butter, emulsifying wax and Castile soap in a large container. Next, divide the sugar scrub into two parts. Add .1 oz. of lavender essential oil and a pinch of violet ultramarine pigment powder to one container. Then add .1 oz. of lemongrass essential oil and a pinch of yellow iron oxide powder to the other. Mix well, then layer in the same way as the peppermint foaming sugar scrub. Why do you need emulsifying wax when there’s is no water used? The emulsifying wax both thickens this scrub and keeps it from feeling oily/greasy on skin. How long can this scrub be kept for?what gentler alternatives to sugar and salt could I use as the exfoliant? Do you really use a 1/4lb (4oz) of Castile soap, and not 4 fluid ounces? Yes, these are weighted measurements for better accuracy.